Peripheral Arterial Disease, or PAD, generally refers to disease of the arteries outside the heart and brain. PAD is commonly seen as narrowing or blockages of arteries in the legs, although it can occur in the arms and arteries of the abdomen as well. 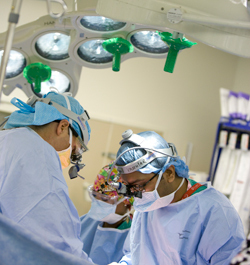 Montefiore has long been recognized as a premiere limb salvage center regionally, nationally and internationally. Our vascular surgeons have extensive experience in dealing with vascular diseases of the upper and lower extremities and offer the full range of open, endovascular and hybrid approaches for the treatment of this disease. The majority of people with PAD will not have any symptoms and do not require any invasive treatment. Nonetheless, it is important to be aware that one has PAD in order to put in place lifestyle modifications to reduce the overall risk of a cardiovascular event. Such modifications include blood pressure control, dietary modifications, smoking cessation, and exercise. Other medical treatment can be beneficial as well. When symptoms do develop there is a wide range of possible symptoms. These range from pain in legs when walking (which may also be caused by other, non-vascular conditions), to constant pain in the legs, to ulcers and even gangrene. PAD may be diagnosed by a number of methods, many of them non-invasive. The simplest test is an ankle-brachial index, or ABI. In this test the ratio of the blood pressures in the legs is compared to that in the arms. If the ratio is low, PAD is likely to be present. The next test is called a Pulse volume recording. In this test cuffs are placed on the legs, which allows the very small volume changes that occur with each pulse to be recorded. This test gives a measure of the overall blood flow at various levels within the lower extremities. If the waveforms are low, PAD is likely to be present. A duplex ultrasound mapping looks at the blood flow in the individual arteries in some detail. This test can detect narrowings or blockages without the use of needles, contrast dyes, or radiation. Other tests that diagnose PAD and locate blockages specifically include Angiography, CT angiography, and MR angiography. Treatment for PAD can be performed using minimally invasive endovascular techniques, traditional open surgical techniques, or a combination of the two depending on the individual patient's anatomy and symptoms. Our vascular surgeons have particular expertise in the minimally invasive technique of subintimal angioplasty and helped pioneer this procedure in the United States. 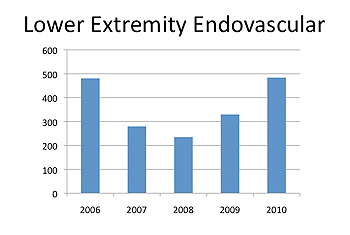 Other endovascular treatments offered include balloon angioplasty (with and without stenting), cryotherapy, and artherectomy (laser or mechanical). When endovascular options are not feasible, our surgeons remain international leaders in the performance of complex bypass surgery. 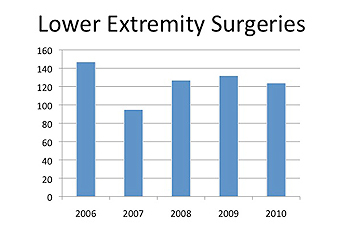 These procedures can be performed with the patients own vein or synthetic grafts.